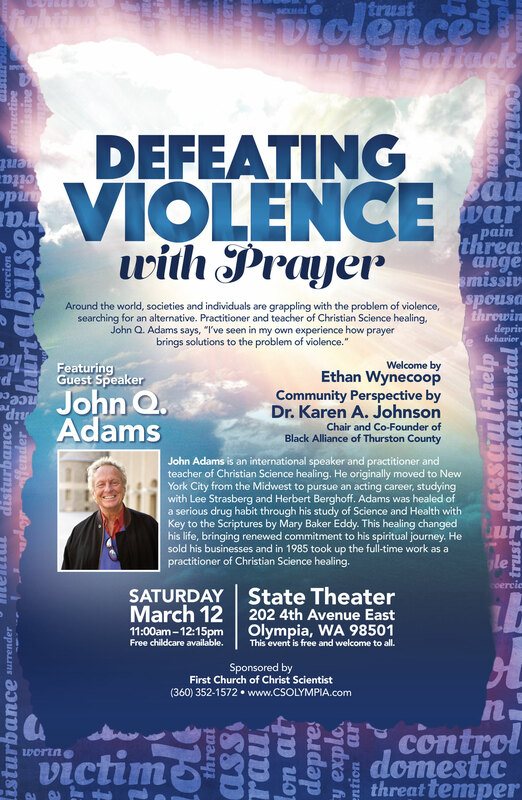 We’re sponsoring a free talk by John Quincy Adams, III, CSB on Saturday March 12 at 11:00 a.m. at the State Theater (aka Harlequin Theater) in downtown Olympia. Join us in discussion spiritually-based solutions to violence. Around the world, societies and individuals are grappling with the problem of violence, searching for an alternative. This lecture offers prayer as a solution. It presents three illustrations of individuals who overcame violent impulses through prayer that awakened each of them to their true spiritual nature as a child of God. Through an acknowledgement of wrong, both had major character transformations that resulted in physical healings as well: one of a severely injured hand that occurred during a fist fight, and the other of fractured facial bones from a motorcycle accident, and a medically diagnosed case of diabetes. This lecture also includes an account of an individual that had been shot six times who recognized that his quick and complete recovery included his forgiveness of his assailant. The major thrust of this lecture is to emphasize that evil cannot be defeated with evil, but that it can be overcome and destroyed through our prayers and good efforts. This entry was posted in Uncategorized and tagged CSB, III, John Quincy Adams, lecture, peacemaking, violence. Bookmark the permalink.